The set was billed as David Rodigan & The Outlook Orchestra. However, we were about to be taken on a musical journey the likes of which I have never seen or heard before. Going into it and based on the stage setup I thought David would be playing some records, there would be a band, and hopefully a few special guests if we were lucky. At 12:45am sharp the curtains parted to reveal a full orchestra including two drum sets, horn and string sections as well as a slew of other musicians, all led by conductor Tommy Evans. First up, the Ska era and David presented Bitty McLean who of course did Simmer Down which was the first single recorded in 1963 by The Wailers, accompanied by The Skatalites and produced by Coxsone Dodd. This number one hit in Jamaica has been widely copied round the globe. As Bitty performed, David danced around the stage and at one point, with maximum respect, directed attention to the impeccable horn section during their solo. David was the curator of this momentous evening but from the first moment, he continuously shined the spotlight on the orchestra and his special guest performers. After some more Ska with Hollie Cook as singer, Rodigan welcomed Bitty McLean back on stage calling him “one of the great Rocksteady, Reggae singers of all time.” Drum and bass became more pronounced as Bitty and a few other special guests including Charmaine Hector performed Alton Ellis’ I’m Still In Love With You and Desmond Decker and the Aces’ hit Shanty Town from their debut album in 1967. Now it was time for Roots Rock Reggae as David brought onstage a youth from London, Kiko Bun who had a perfectly versatile voice for, an interesting choice for the first song here, Police and Thieves originally by Junior Murvin in 1976 but was famously covered by The Clash a year later and was instrumental in bringing a Reggae beat to the world. Kiko also did a great rendition of Sun Is Shining, Bob Marley’s Lee Perry produced track from 1971. A history of Roots Reggae would not be complete without Satta Massagana by The Abyssinians which Bitty McLean did in fine style. “In the 80’s things changed. 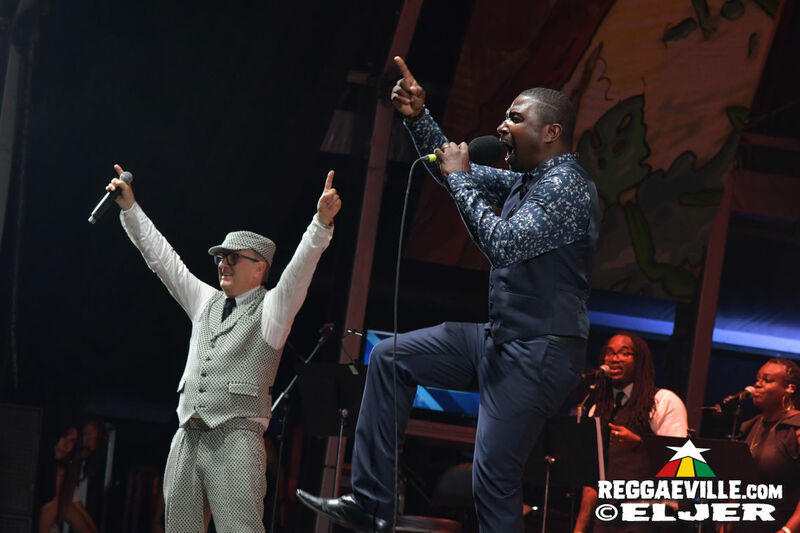 Are you ready for Dancehall!” said David as Damian Marley’s Welcome to Jamrock thundered down upon the Rototom Massive! 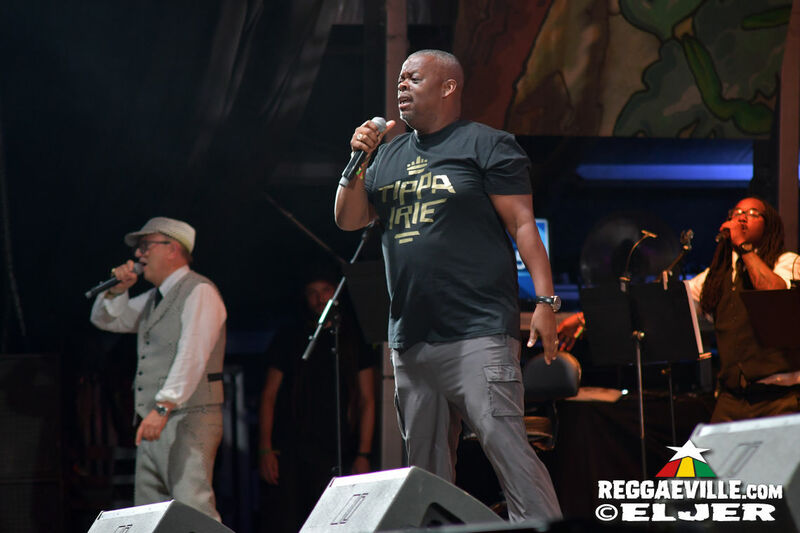 This was followed up with Kiko’s extended version of Ganja Farmer by Marlon Asher and then out came Tippa Irie who busted out many of the classic Dancehall anthems including a Beenie Man medley as the fans jumped up and down. 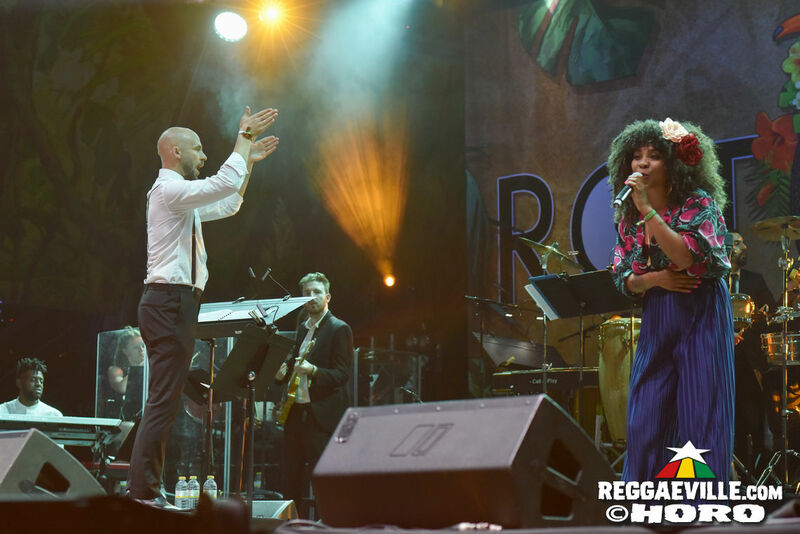 And to finish off this special set Rodigan and Tommy Evans presided over a full orchestra rendition of Bob Marley’s Redemption Song while, unsolicited, the crowd sang in unison for the entire song. And finally Hollie Cook was brought on one last time to do You Don’t Love Me (No No No) by Dawn Penn. This should go down in the Rototom archives as one of the best sets ever. “This was a very important historical document. One of the problems in recent years with our music is that some of the songs performers sing on stage… they lack definition, they lack completion… there was a time when Gregory Isaacs would sing all his songs… we’ve seen our music condensed and shrunk down and shortened and I find that disturbing and I don’t understand why it is happening… I’m sorry if I appear to be criticizing elements of the way the music is performed but this is an observation I feel duty bound to reflect upon. The fact there are no chord changes… seems to me there are only certain artists who are taking this music to another level. Hype over substance does not stand up to close scrutiny. CLICK HERE FOR THE FULL PHOTO REPORT!